New Zealand is easier to see than write about so this post includes more photos and less text (see part I here). Auckland welcomed China Southern Airlines’s Airbus A380 and our delegation with a water-cannon salute as we taxied to the terminal. A cool start to a fantastic trip. New Zealand is dominated by two islands Southeast of Australia. The major population centers are on the North island, but the grand scenery made famous in Peter Jackson’s Lord of the Rings trilogy are found on the South Island. Even now New Zealand’s location offers protection from over-development and a property law called “the Queen’s Chain” a regulation that set aside a strip of land sixty-six feet wide along every beach, river and large lake for public use. This allows residents and visitors to use beaches and waterfronts for camping and other recreation. The idea is deeply embedded in New Zealand culture and a lot of the pop icons I came across reflect how important outdoor activities and water sports are to New Zealand. New Zealand is a new country; the oldest residents claim ancestors from the Maori, Polynesians who settled New Zealand more than 700 years ago, and the European influence arrived in 1769 with English Captain James Cook’s first visit. 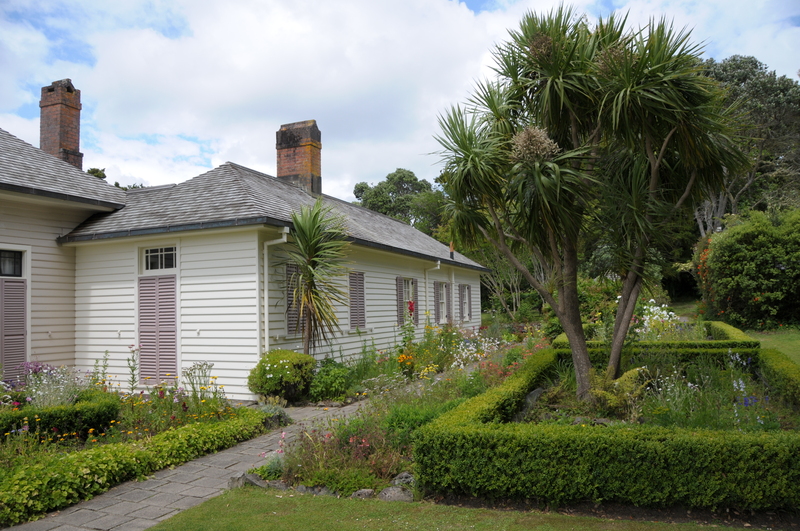 James Busby’s home, The Treaty House (above), is where the Waitangi treaty was signed to establish New Zealand as a British Colony in 1840. 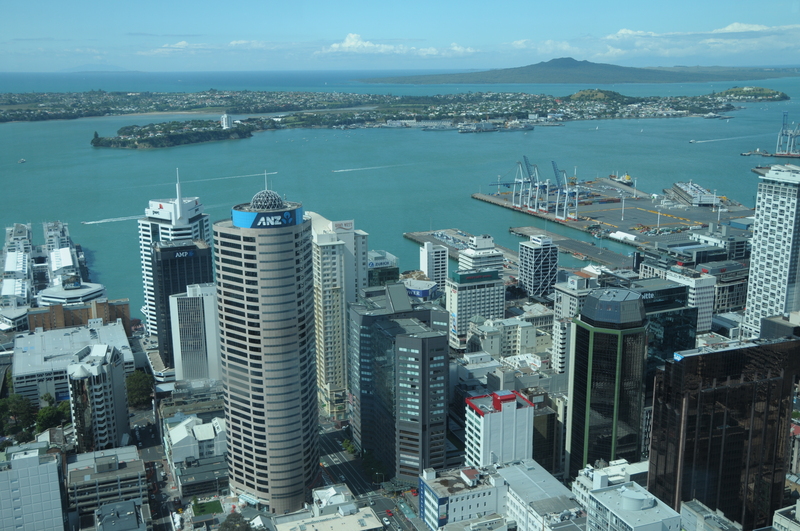 Our group arrived on a Monday evening and checked into the Skycity Hotel and Casino in downtown Auckland. The hotel is situated on a hill in the central business district and has excellent views of the harbor and surrounding city. Its location was an easy walk to restaurants and bars along the waterfront and a short drive to most attractions. For efficiency our delegation was divided into manageable groups and each was assigned to a single tour bus. Each group had a different itinerary which reduced the disruptions that would occur if four hundred people showed up to every attraction. Things to do and places to visit: We used Great Sights New Zealand as our tour operator. 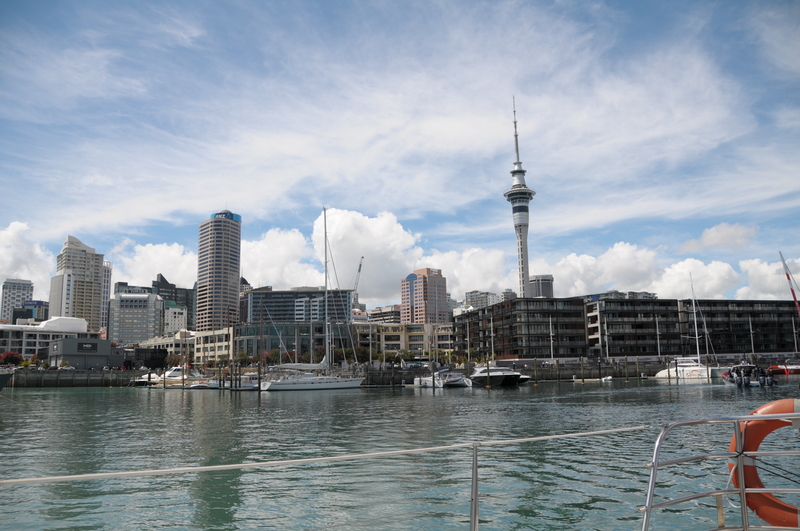 They offered an extensive list of day-long and overnight activities in and around Auckland and the North island. 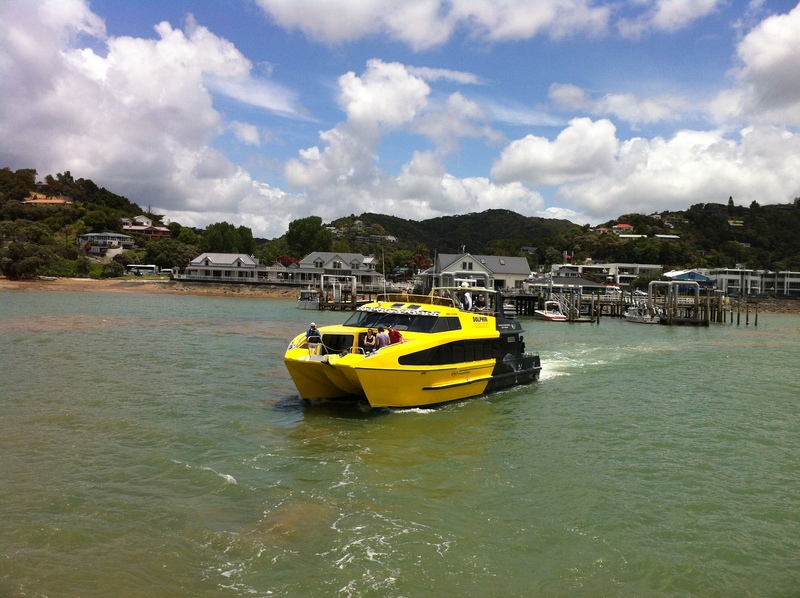 We managed to do most of them and all of us enjoyed the Bay of Islands tour and Hole-in-the-rock. Another favorite was our Auckland Harbor sailing which included a close-encounter with the Emirates Team New Zealand yacht preparing for the America’s Cup Race in San Francisco in September, 2013. Our tour at Kelly Tarlton’s aquarium, home to the original shark tunnel was outstanding, and only fifteen minutes from downtown. Even our hotel got in on the action since it featured Auckland’s most prominent landmark, Skytower. The tower was an excellent place to view the harbor and many of the numerous volcanic domes around the city. Our last tour included a visit to Hamilton, and the glowworms in the Waitomo caves. They’re amazing creatures and well worth the beautiful three-hour drive South of Auckland. It’s also worth saying that we enjoyed excellent food everywhere – from fresh sushi at the fish market to perfect fillets and local dishes in a variety of restaurants around the port. Bay of Islands tours depart Pahia near the Waitangi Treaty Grounds North of Auckland (pictured above). The Great Sights boats navigate through the Hole in the Rock (below). New Zealand is a unique blend of people, geography, history, location and weather; you could travel a long way before you find anything else like it. I can’t wait to visit again and next time I’ll check out the South island. China Southern Airline Company invited me to attend their 2012 partner conference in Auckland, New Zealand. This gave me a chance to learn more about Asia’s largest carrier and the world’s sixth largest. Conference participants were invited to connect via the new Baiyun International Airport (CAN) in Guangzhou, China enroute to Auckland (AKL). Since my journey started in Dallas (DFW), I transferred to China Southern’s daily Airbus A380 service from Los Angeles. This gave me time to explore their new plane and three days in Guangzhou and the Pearl Hotel (owned by the airline and available to passengers with tickets in Business Class and First Class on International flights). The short notice required a call to CIBT Visa services to add pages to my passport at the US State Department’s processing center in Miami, then on to the Chinese Consulate in Houston for a six month, multiple-entry, business visa to enter China and join the other delegates. My American flight to LAX was uneventful, and the connection was long enough to visit the Admiral’s Club at Terminal 4. I recharged, enjoyed the refreshments and updated the settings on my Iphone before the short walk to the Tom Bradley Terminal. The International Terminal at LAX is undergoing a renovation, but still provides a convenient connection from the domestic terminals. Once past security travelers with lounge access will find a quiet atmosphere, inviting finger food and a well-stocked bar at the China Southern Airlines’ multi-airline lounge. After a quick look around it was clear that good weather and the additional jumbo-jet gates to handle A380’s and 747-800’s will maintain LAX’s position as one of the busiest airport in the world (6th) and North America’s favorite gateway to Asia. The Airbus A380. An incredible airplane. Since all seventy, read Seven-Zero, business class seats are on the upper deck, you’re not faced with a simple, “which side of the plane are you sitting on” question from the flight crew. Before the gate staff release you to approach one of the three jet-bridges they asked if my seat was upstairs or downstairs? After climbing the ramp to a jet-bridge that led to the upper-deck I noticed the view over the Boeing 777 at the next gate. The fuselage is almost 28′ high and 34′ above ground level. It was a long way down from the doorway. The interior was well-designed. 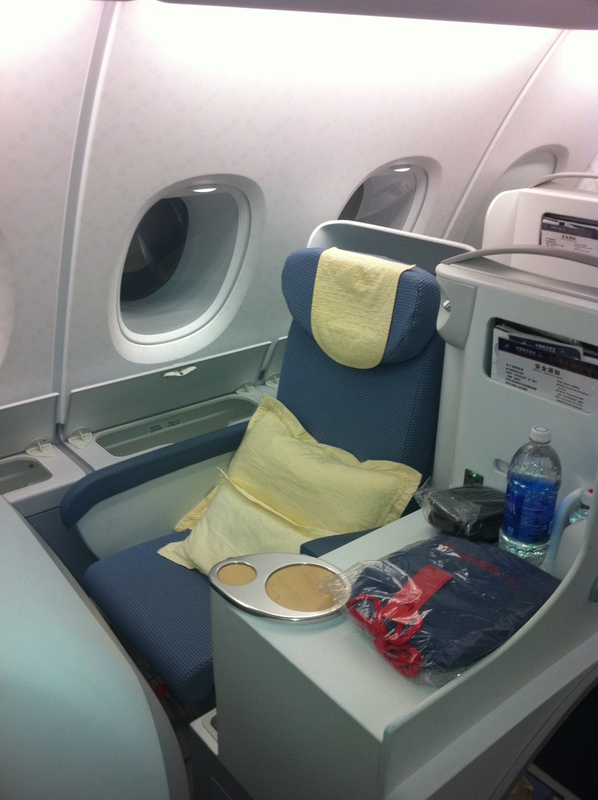 China Southern’s business class seats are very good. The 1-2-1 configuration offers aisle access to every seat and adequate privacy between seats. They’re staggered so the foot-well for the seat behind you is under your table and storage bins. The best seats are at the windows with a ‘table’ between the aisle and the seat, but even the least desirable seats were good. The fabric-trimmed seats are comfortable, and open to a level and flat position for sleeping. They provide lots of personal storage, power ports for different plugs and a USB cable, and a large LCD screen with an excellent movie selection (I spent sixty hours on-board over ten days and only made it through half the movies I wanted to watch). The amenity kits included all of the items you would expect to find: a toothbrush, toothpaste, mouthwash, comb, perfume, lotion, lip balm, earplugs, and an excellent eye-shade with two straps. They also provide a comfortable, two-piece, pair of dark blue cotton pajamas to size, trimmed in dark-red, and matching slippers. Many of the travelers in my cabin took advantage of them for the sixteen hour ride. Onboard service was excellent – the menu included a mix of familiar Chinese and Western dishes offered in several courses that didn’t leave anyone hungry. Mid-flight snacks and beverages were available on request in the galley or self-service from the forward bar (yes – there is a bar, no lounge, but a good selection of wines, liquor, fruit and chocolates). After the dinner service I descended the grand staircase to the forward cabin to start my self-guided tour. First stop, the superb First Class seats, actually very private ‘compartments’ in the nose on the lower deck. Next, three sections containing typical Coach Class 3-4-3 seating. The seats reclined well, but self-service snacks and personal LCD screens were competing for recognition as the most popular feature. Mission accomplished I climbed the spiral staircase in the tail and passed through the coach cabin on the upper deck before stopping in the business class galley for a snack before I started my next movie. The Westbound flight arrived in Guangzhou on Saturday at 5AM local time two days after the midnight departure from LAX. It was strange to spend sixteen hours in the dark, but the long flight left me ready to tackle a tour in Guangzhou after clearing immigration and my morning check-in at the Pearl Hotel. Baiyun International Airport – Shares features with other contemporary greenfield airports, its massive and well-designed. Passenger movement is easy and signage is clear. Open for only a few years they are already working on a third runway to increase capacity. 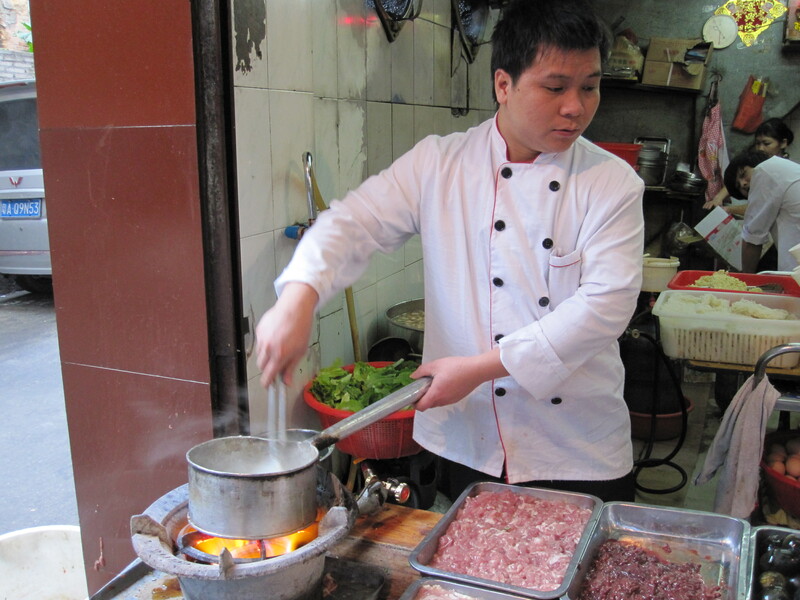 There are dozens of shops and restaurants and every service you would expect to find in a major International hub. The modern Guangzhou Metro is located in the central terminal and downtown is accessible with luggage in tow. 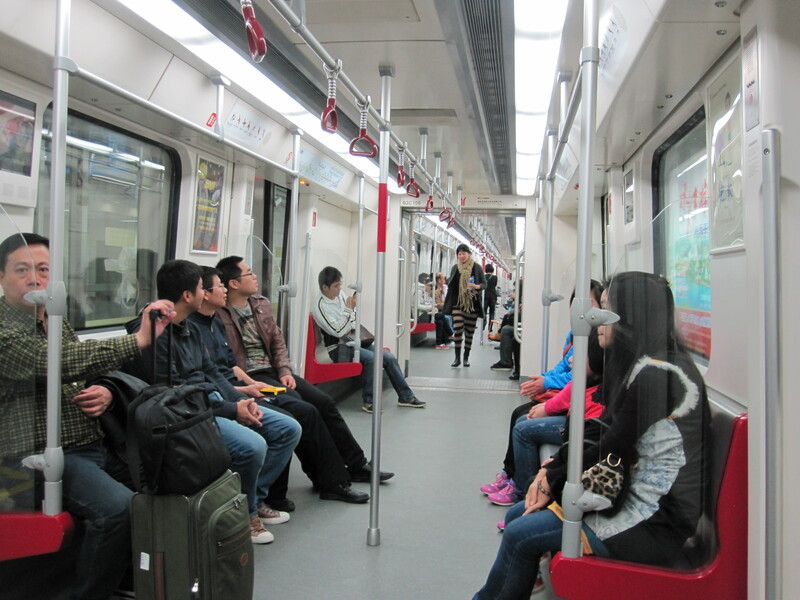 The Guangzhou Metro rivals any of the smoothest, most comfortable subways in the world. The modern gates, new trains, continuously welded rail, and digital moving-maps displays in the cars combined to create a stress-free travel experience. People were friendly and courteous, but the trains did fill up later in the day, and service ended earlier than I was accustomed to especially compared to London, or New York schedules. Although Guangzhou is a large metropolitan area the new subway doesn’t have closely-spaced stations. I covered considerable distances by foot and used cabs to move between attractions in the city. Cabs were inexpensive, ten Yuan for the first 2.5km translated to roughly $2 for the first 1.5 miles. They didn’t charge extras for more passengers, but you should insist they start the meter once they’re moving. Additionally, I found that few drivers spoke English, so I frequently used a tourist map from my hotel to explain to drivers where I wanted to go. Where to go. New Town, is an incredible collection of modern buildings, arenas and sporting venues with a large mall through the center (above and below ground). I found thousands of people everywhere I went, but New Town was a great place to start. 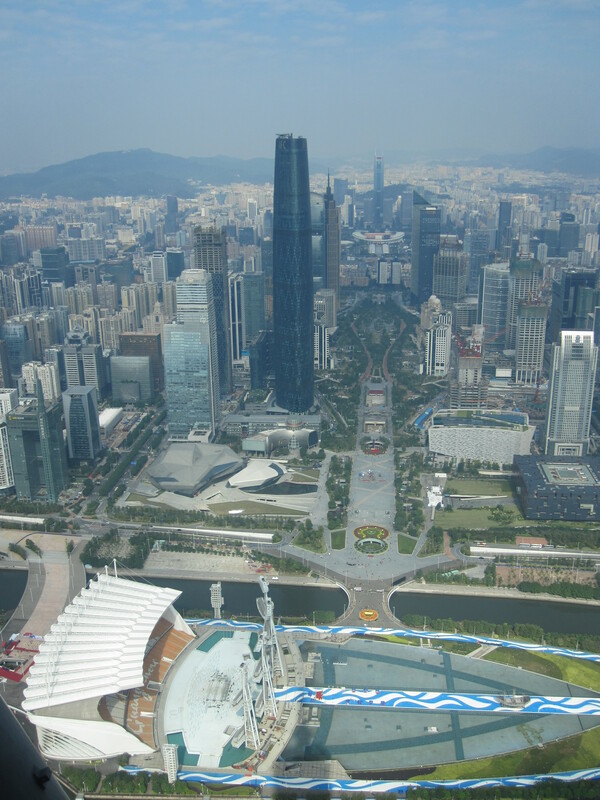 When I finished there I took a train to the South side of the Pearl River to view the city from the Canton Tower. The tower was a great place for perspective on the enormous city. 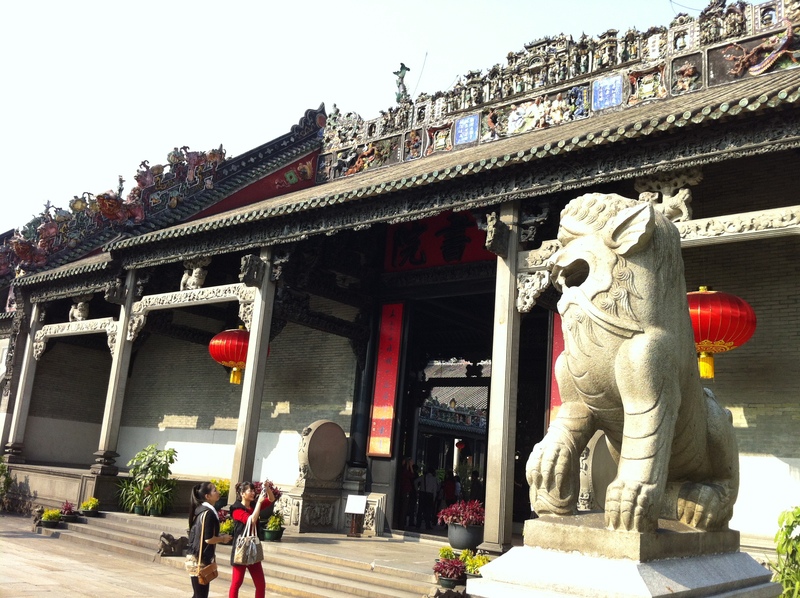 Next I took a cab to Beijing Road Shopping Mall for a quick look, then another cab to the Chen Family Temple Compound (Guangdong Folk Art Museum), and finally the Shangxiajiu Pedestrian Street in the Liwan district. 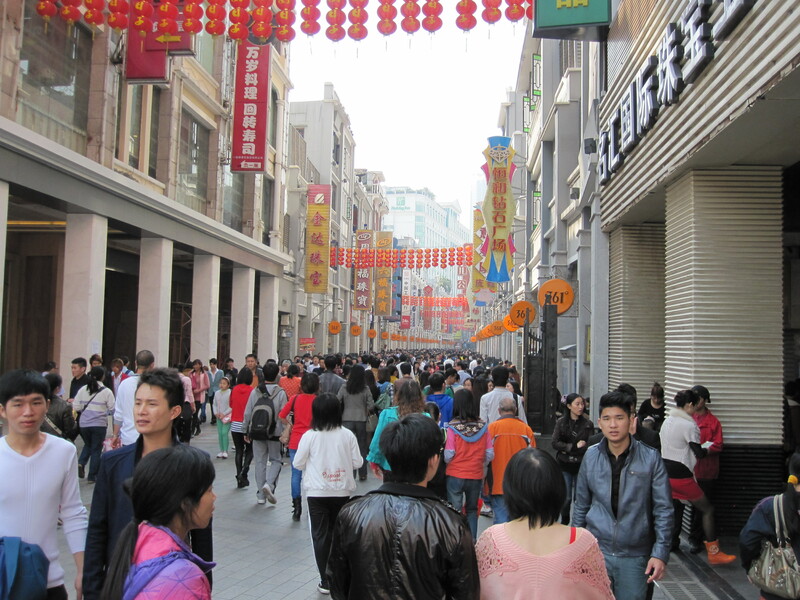 Shangxiajiu Pedestrian Street above, and a shoe store in Liwan below. 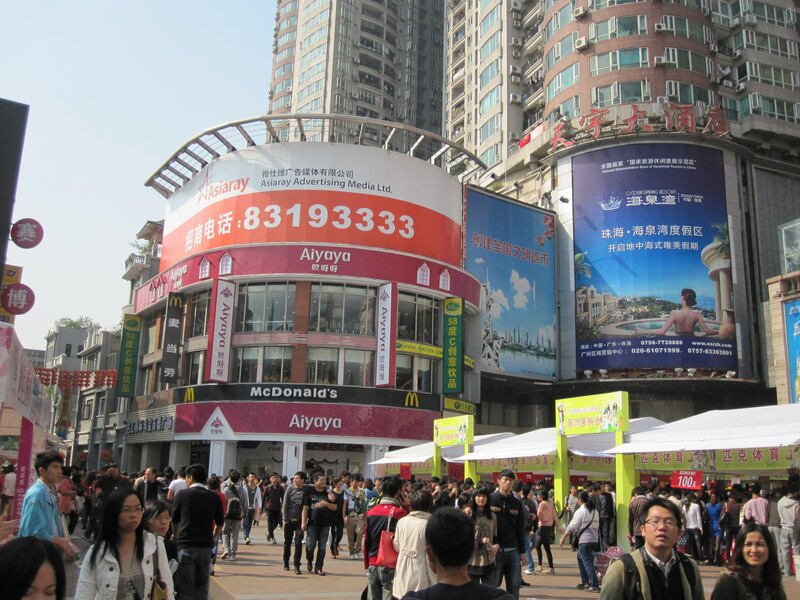 Guangzhou is one of the busiest retail cities in the world – it’s full of malls and markets and hosts several markets for corporate buyers throughout the year. 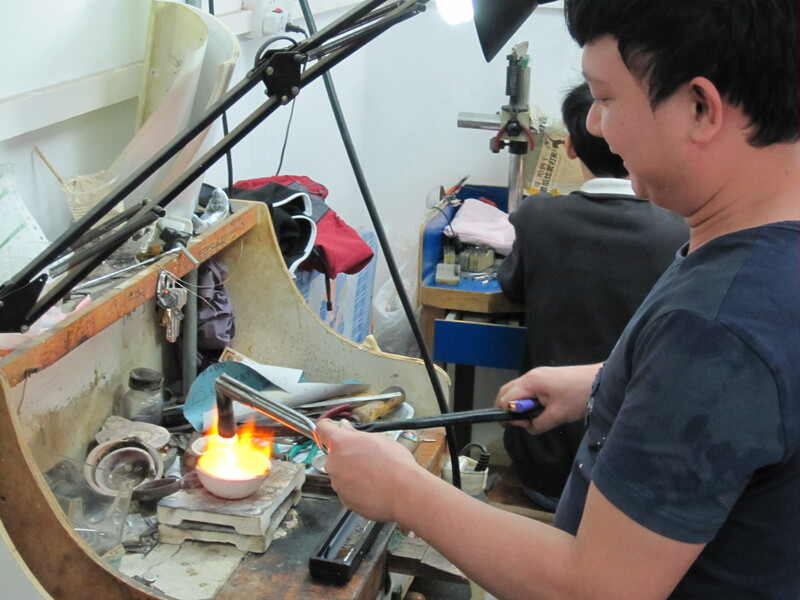 There are entire streets dedicated to a single item – I found the belt street, framing shops, and several extensive jade markets. 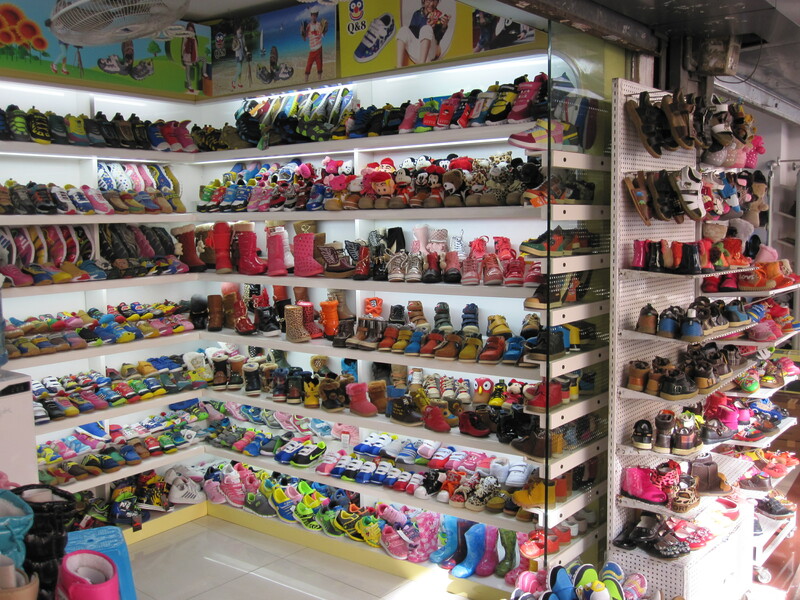 The back alley shops were the most interesting for me – I could have stayed a week to explore the neighborhood markets in Liwan. I did return the next day, and again the following weekend with several colleagues, but Sunday evening, I joined the China Southern Airlines Company delegation at the Pearl Hotel for our flight to New Zealand. A sidewalk restaurant a few blocks west of Beijing Road (above), and a jewelry-maker near the Jade Market North of the Shangxiajiu Pedestrian Street (below). In part 2 I’ll describe Auckland and the surrounding sites.